Have you ever been in a meeting and had an engineer tell you that they hate marketing? I have. The childish reaction, of course, is to tell them that you hate engineering ... so there. But that’s silly. And so is the idea that engineers hate marketing. “Engineers hate marketing” is just a sweeping generalization and I find that sweeping generalizations are a great way to start blog posts that you’re hoping people will read – like this one. That said, "sweeping generalizations" is also one of the reasons engineers get irritated with marketing. Engineers appreciate precision. It’s part of who they are and what they do. When marketers generalize, it doesn’t fit with the engineering mindset. And that’s one of the reasons why an engineer might tell you he or she hates marketing. There are other reasons, of course. They’re sort of the ‘deadly sins’ of marketing to engineers but by my count it’s not 7 – it’s 5. Making big claims that can’t be quantified. As marketers, we love to use superlatives. We also like to make big eye-catching claims. Both immediately set off the BS alarm for an engineer. Engineers build things that have to work reliably and there are real consequences when those things don’t work. So empty superlatives like “faster," “better,” or “easier” mean nothing if you can’t back it up with bullet-proof data. The Fix: Don’t make claims without real data and/or case studies to back it up. In some cases, third-party validation is the only thing that matters. If you don’t have it, push your product team for it. And if you can’t get it, rethink your strategy. Not understanding what we’re selling. It takes years of schooling to become an engineer because it’s a difficult subject matter. There’s also an entire language of acronyms and terminology that only engineers use. And if you can’t talk the talk in a way that makes it sound like you understand the context – not just the content – of what you’re saying, you’re wasting an engineer’s time. The Fix: Don’t base your marketing on the crazy PowerPoint that the product team put together. Talk to them. Spend some time with them. Ask them questions. Make them show you how it works. Make them focus on why it really matters to the people who’ll buy it. And listen to the words they use. The more context, the better. Not understanding what you’re selling and not being creative are cause and effect. Great creative is always based on great insight. So if you don’t understand what you’re selling (beyond the feature list that the product team provided), there’s no insight. The Fix: Stop focusing on technical features. Engineers don’t care much about features unless you can draw a direct line to how those features make their products safer, smarter or more efficient to build. So work with the product team to prioritize which features matter most and figure out what the actual benefits are to the engineer. Again, that means sitting down with the product team before you start ticking your tactical boxes. Not taking it seriously enough. Humor is a very subjective thing and while (almost) every engineer has a sense of humor, it’s not usually around what they do. That means you have to be very careful with humor – engineers don’t have a lot of time for jokers. The Fix: Stupid humor rarely works with engineering. And don’t confuse ‘silly’ with ‘clever”. If you’re not sure whether your idea is stupid, silly or clever, run it by a few people you trust before you put it out. I’m never a fan of advertising by committee – except in this case. Engineers get just as many emails as you do. Reading them all is a job on its own. When you blast one at them every day, they get annoyed. Very annoyed. The Fix: Get a better understanding of the buying cycle. In most cases, engineers don’t buy things quickly or impulsively, so continuously peppering them with marketing materials like they’re going to buy something from you today is not a great strategy. Understand the buyer’s journey. Segment your lists more effectively. It’ll make your efforts more impactful and your marketing less annoying. 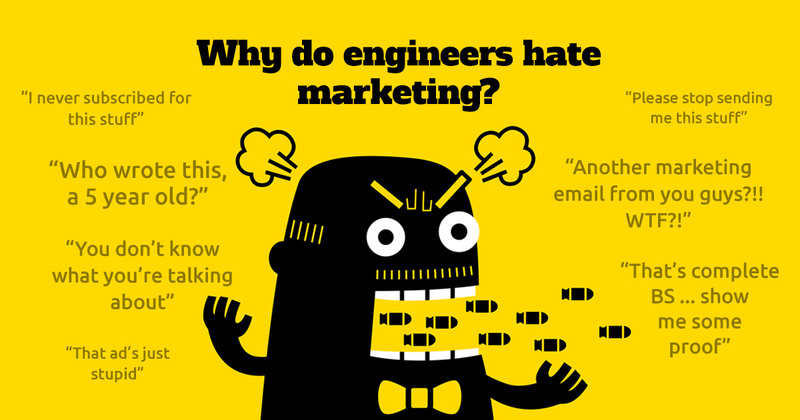 The Takeaway: Engineers don’t hate marketing any more than you or I do. What they hate, is bad marketing, lazy marketing and marketing that isn’t relevant. To talk to engineers, we’ve got to take the time to understand how they think. Precision. Process. Logic. They’re all part of an engineer’s mindset. And if we don’t want to create marketing they hate, we need to make it part of ours.